Photo copyright: nikkytok / 123RF Stock Photo. Photo used under license. Barbecue season is in full swing here in these parts, so I thought it would be a good idea to review how to properly marinate meats. The truth is, I’m not experienced with this. So I had to do some research, and I’m glad I did. You can bet my barbecue is going to take a giant leap forward in the flavor department this summer! For real flavor, you can’t beat a good marinade. I’ll have recipes coming up in the coming days, so stay tuned for that. But in this blog post, I wanted to review the how’s and why’s of marinating. Because if done properly, you simply can’t outdo the flavorful impact you’ll enjoy at your next meal. And just because I’m referring to barbecuing, doesn’t mean you actually have to barbecue these meats. Marinated meats can be cooked just the same as any other meat, in any form you like. It’ll just have more flavor in the end. So lets get started, shall we? Now I realize that some of those time frames offer a pretty wide range. But generally speaking, the longer you marinate, the better the flavor (except with seafood. see below). Nothing beats a good piece of meat that’s been marinated at least overnight. Yum! That being said, there is a limit. For meats (not seafood. see below), you never want to exceed 48 hours. But 24 hours is generally the longest you want to shoot for or the marinade can start to affect your meat’s texture. And remember to NOT add salt to your marinades. It might seem like a good idea at the time, but the truth is that salt will dry out your meat as it cooks. So save that salt shaker for the dinner table. Might seem odd, but the containers you use for marinating matter. With any acidic foods, you want to avoid aluminum containers or foil. Your meat won’t taste very good if you do. So what can you marinate in? This is, of course, just a general rule of thumb. But the idea is to get the meat completely submersed in the marinade. Just don’t reuse the marinade as sauce without properly boiling it first, or you’ll be pouring raw meat juice all over your yummy dinner. Ick! Nothing could be simpler! Make your marinade, then choose a marinade-safe container to put it in. Plop the meat into the sauce making sure it’s well covered or sealed, and let it sit! Easy! If you’re barbecuing chicken, it tends to be easier to marinate without the skin. That doesn’t mean you HAVE to remove the skin, but it helps for stronger flavor. 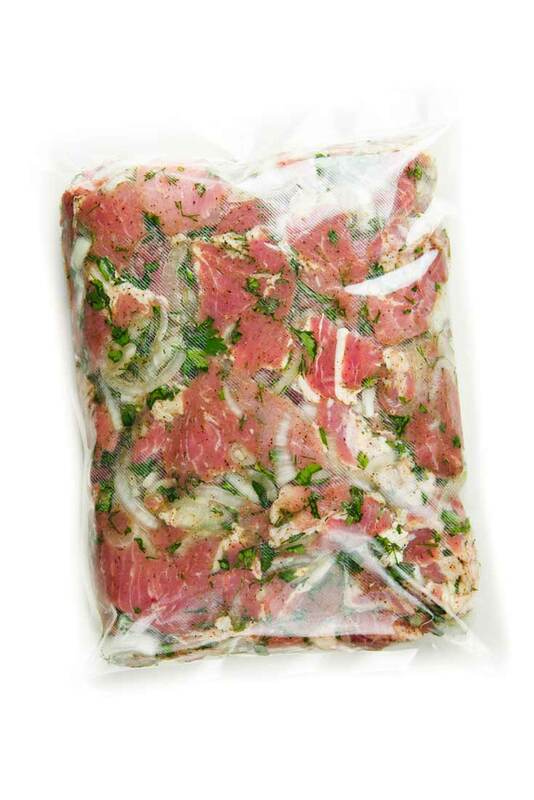 Marinating beef is best done with tougher cuts such as flank, skirt, sirloin and round. Never marinate seafood for longer than 30 minutes or you’ll end up with mushy seafood. That applies to shellfish as well, though shellfish is best kept to just 15 minutes. See all my marinade recipes here. « 5 Clean Eating Seafood Recipes You Can Prep In Less Than 20 Minutes! What is the calcium content for the homemade almond milk? How does this compare with store bought almond milk with the added calcium? Georgia – You would have to look up the content in almonds. I’m not sure, sorry. That article was really helpful, thank you. Hey: Do you have some good marinade recipes for chicken and beef? Margaret – Yes, the link is at the bottom of the post here, just before the sources.